Some people are praying for cooler weather to make their commute more bearable, some pessimistically suggest that this isn’t going to last while others simply soak up as much sunshine as they can get while it lasts (I’m firmly in the final category). The only thing we all seem to agree on is that they just don’t make summers like they used to. A lot of this is nostalgia, of course. In the same way that holding a cornetto as an adult makes you feel (is this just me?) like some sort of fat-fingered giant, those long, hot childhood summers felt long and hot because we were smaller, time passed more slowly and planning for the future meant working out how to spend your pick-and-mix money not marriage or children or careers. I turn twenty nine tomorrow, and although we were at my parents’ house in Italy for at least half of my birthdays as a child, I celebrated enough of them in England to remember that the weather wasn’t always perfect. On at least one occasion my Dad heroically barbecued outside under an umbrella; one year slightly less heroically melting the top of a plastic children’s table he’d commandeered to create a makeshift shelter from the rain. This Saturday just gone we kick-started celebrations with bubbles, food, friends and – in true British and little loaf birthday style – a barbecue in the rain. The day also marked exactly five weeks until Carnivorous Fiancé and I tie the knot (something so incredibly exciting I can’t think about it too much or I might not sleep the entire time until then). Our third and final cause for celebration was something a little simpler; these tarts. 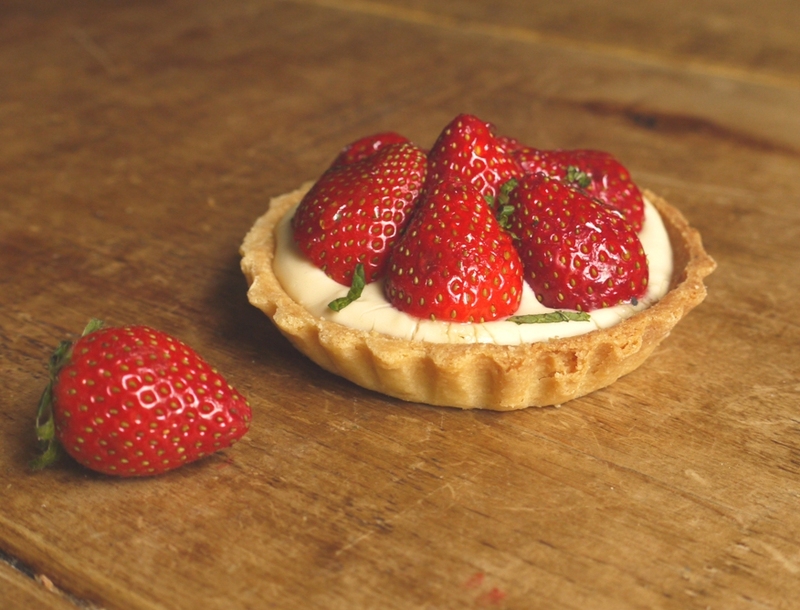 Last Sunday my recipe for strawberry and Pimms tarts with cucumber glaze was featured as part of an article on Britain’s best food bloggers in The Sunday Times magazine. To have a recipe included in a national newspaper was completely wonderful, to be mentioned in the introduction as one of ‘Britain’s best food bloggers’ was something else: thrilling, humbling and slightly unreal. And absolutely worth raising a glass of bubbles (or Pimms) to. You can find the recipe on The Times website here. I’m afraid it’s behind a paywall, but (whispers and hopes The Times are looking the other way) if you don’t want to subscribe there’s a slightly devious screen grab on my Facebook page with all the details here. You thoroughly deserve the accolade; it’s not just that your subject is always interesting, you write well too, which is rare. Have a lovely day tomorrow, and try to sleep – trust me, you won’t sleep at all the night before your wedding, you’ll just lie there saying: “I can’t believe I’m getting married tomorrow”! Anyway, your tarts look so pretty Kate – I love the idea of a strawberry and Pimms combination 🙂 Happy birthday for tomorrow, I hope you won’t be hit by the ‘Baker’s Curse’, whereby nobody bakes you anything because they think it won’t live up to your own creations! Bakers Curse is totally a thing! Some friends bought me cakes on Saturday because they were too scared to bake me something themselves…they were lovely but would be more than happy with something homemade, it’s totally the thought that counts. Happy Birthday! These tarts look magnificent. Congratulations also on the magazine article, it is definitely well deserved. Congrats on the Times article and have a lovely birthday! Lovely post! Those tarts look fab! The weather is a topic of conversation everywhere. Barbecue in the rain sounds much better than foggy winter, like mine. Happy Birthday Kate! Off to check these wonderful tarts! Thanks Paula – as long as you have a big umbrella a BBQ in the rain is kind of fun! Congratulations! Your post made me very nostalgic for home. Living away from England while everyone is enjoying a lovely summer is very hard – there are just so many pictures, tweets and other updates showing what a lovely time everyone is having in the sun. 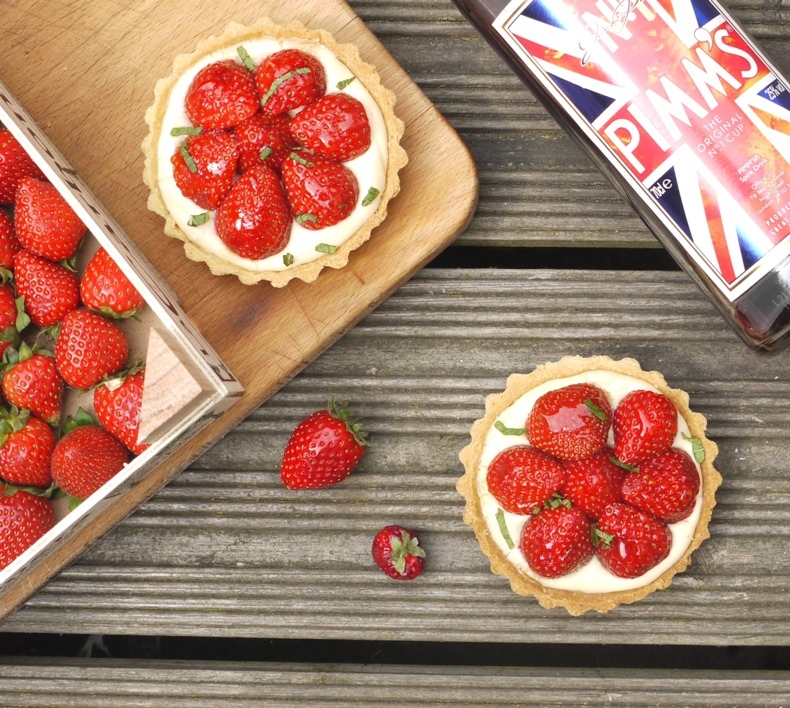 These little tarts look just perfect for the weather too – Strawberries and Pimms – you can’t get much more British Summer time than that! Wow, congratulations on being featured in the Sunday times – that is amazing so well deserved! 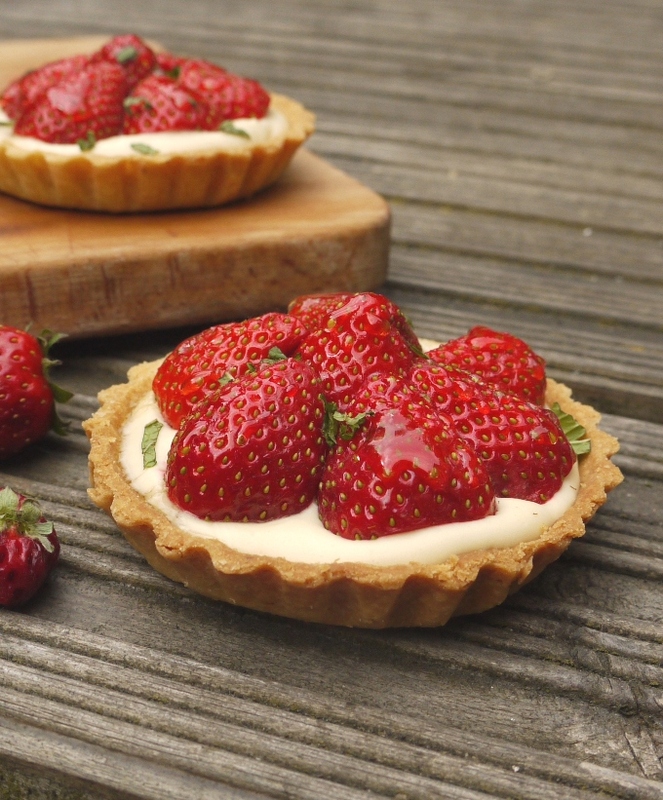 Your strawberry tarts look divine 🙂 And big congrats for being featured in the Sunday Times–what a wonderful achievement! Whoa, these are gorgeous! CUCUMBER GLAZE?! I’ve never tried Pimm’s but I keep reading about Pimm’s-related posts from all the British and Aussie bloggers 🙂 Hope the wedding planning is going well! Congratulations and Happy Birthday, Kate! The honor is so well-deserved. And the recipe that accompanies it sounds divine. I love the cucumber glaze. I’m missing London and just posted on Pimm’s too! Gotta make your adorable tarts to go along with the pitcher next time 🙂 Congrats on the magazine feature and happy birthday! This is amazing! amazing recipe and amazing that that you got featured! That’s my dream! How wonderful. You have a lot to be excited about. 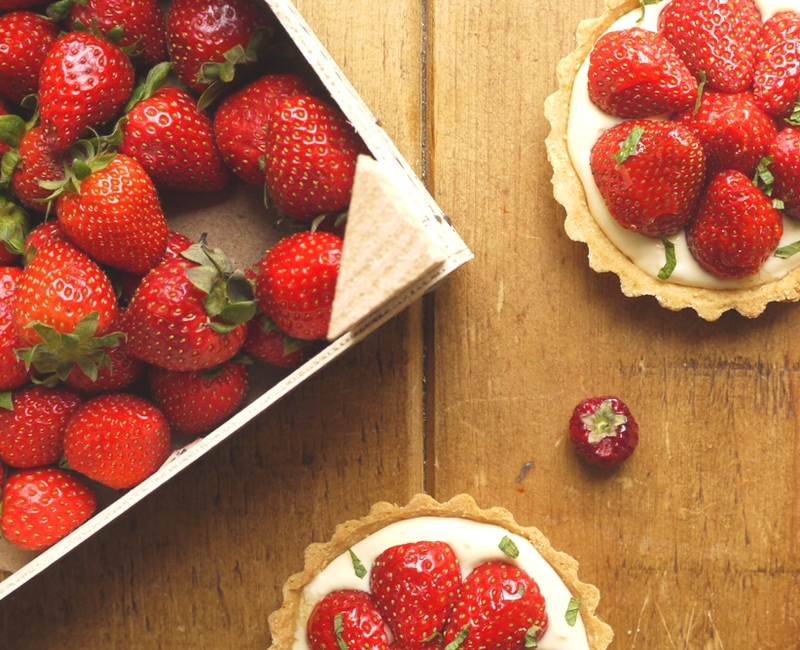 Those strawberries look so perfect, the tarts are beautiful and cucumber glaze sounds intriguing. Many congratulations on your feature…well done you always think up the best combinations. Happy Birthday! And, congratulations on the article. Glad to see (from your cake on facebook) that you’re celebrating in style; enjoy the rest of your day! Great looking tarts, mouthwatering! Good idea too and another way to have a drop of Pimms! Happy belated birthday! What a fine way to celebrate with these delicious tarts. And many many congratulations (and richly deserved!) for being showcased in the Sunday Times!! Congratulations on the newspaper feature! Wow, what a wonderful achievement! It has also been really warm in Switzerland these past few weeks with little rain. After complaining about what felt like the longest winter, I don’t think it would be fair to now complain about the heat so I’m also trying to enjoy it 🙂 These strawberry tarts look like just the dessert for a hot summer evening. Congratulations on the upcoming wedding and The Sunday Times. That is a pretty exciting summer you’ve got going on. The rain barbecue is a time-honoured Northern European tradition. I haven’t managed one yet this summer thanks to Denmark also getting a slightly less extreme heatwave but I am not complaining! I saw the article the other weekend. Congratulations – just wonderful! 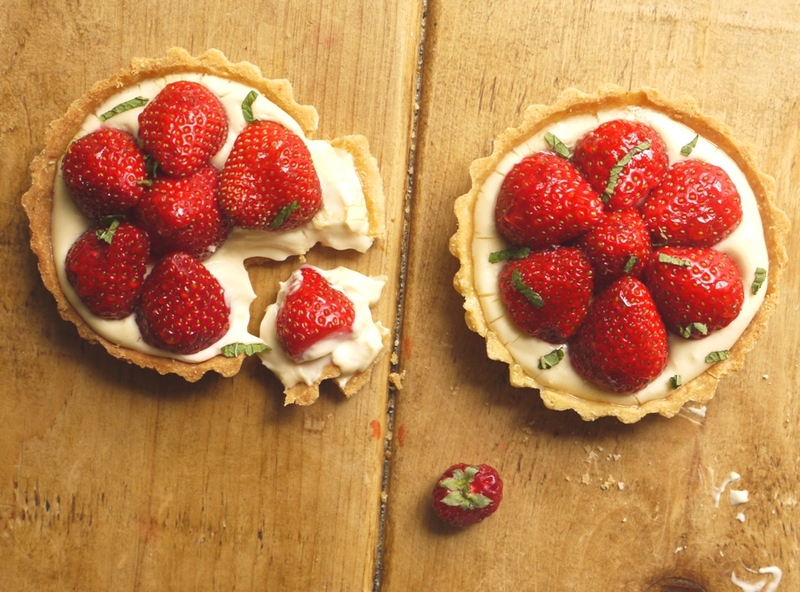 Such a lovely recipe as well…have seen lots of pimms jellies, but not so many pimms tarts this summer! Your tart looks so amazing! Fruit tarts are my favorite and I can’t wait to try this. An amazing tart. Very tasty and polished off in moments..the mark of a great bake! I remember you mentioning this on FB but we were travelling somewhere and am only now catching up on all my reading (I never miss a post of yours) and just wanted to congratulate you on this great happening! This sounds so delicious and what a wonderful idea with the cucumber glaze! Congratulation, well done!